ASH (Action on Smoking and Health) has partnered with YouGov to conduct surveys about the use of tobacco products for many years. Starting on 2012, they began taking data for those who vape (use electronic cigarettes) exclusively, either as a replacement for or alternative to traditional cigarettes or other tobacco products. Now that they have amassed a few years’ worth of detailed data, they have made some very interesting findings. Their results might even surprise some of you. Nearly 3 million adults throughout the UK vape, up more than 2 million in the last 4 years. Just under half of vapers are ex-smokers, who now use e-cigarettes exclusively. Vapers say that they use e-cigarettes to either cut down on or replace traditional smoking entirely, mostly for health reasons. More than ¾ of vapers prefer using e-liquids with relatively low nicotine loads. Nearly ¾ of vapers use less than 4ml of e-liquid per day. Vaping is nearly non-existent among those who have never smoked. Only 15% of the public believes that vaping is substantially less harmful to one’s health than smoking, despite evidence to the contrary. …But of course, the devil is always in the details. Let’s take a deeper look at these results, and what they really mean. How effective is vaping when it comes to replacing traditional smoking? Virtually everyone today knows how devastating smoking can be to your health, and to the health of those around you – cancer, COPD and emphysema are just the beginning. So, one of the things proponents of vaping point to as a positive effect is its ability to replace smoking either as a pathway to reducing nicotine intake or as a way to smoke less (and thereby avoid at least some of the harmful effects). This is the same argument used for nicotine gum or patches. So, what does the report say about vaping helping people to quit smoking? The ASH results would suggest that vaping can help people quit tobacco. 1.3 million UK residents today no longer smoke traditional tobacco products due to switching to vaping exclusively. A further 1.4 million vapers also use traditional smoking products, but use substantially less because they have access to vaping. In all, there is definitive proof that some 1.8 million Britons smoke less today because of vaping. Do smokers really seek out vaping as a way to quit smoking? To keep themselves off tobacco (after quitting). What about the argument that vaping will be adopted by non-smokers, causing them to become nicotine users and perhaps transition to traditional smoking? That was always the biggest argument against vaping – that it would cause young people to become nicotine users and perhaps smokers. The fact is, though, that only 0.2% of vapers had never been smokers – a figure that has not increased measurably in more than 3 years. Does the public understand that vaping is substantially less harmful than smoking? Not according to the ASH survey. 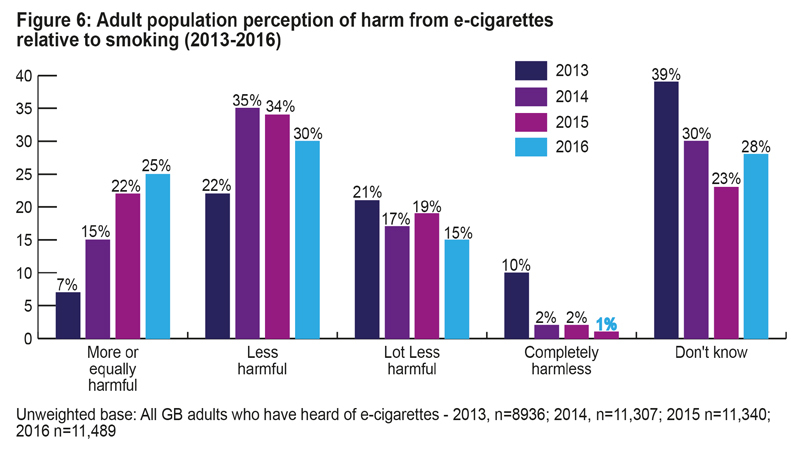 There is a great deal of misunderstanding on this point, and the number of people who correctly identified vaping as the substantially less harmful option is actually falling. 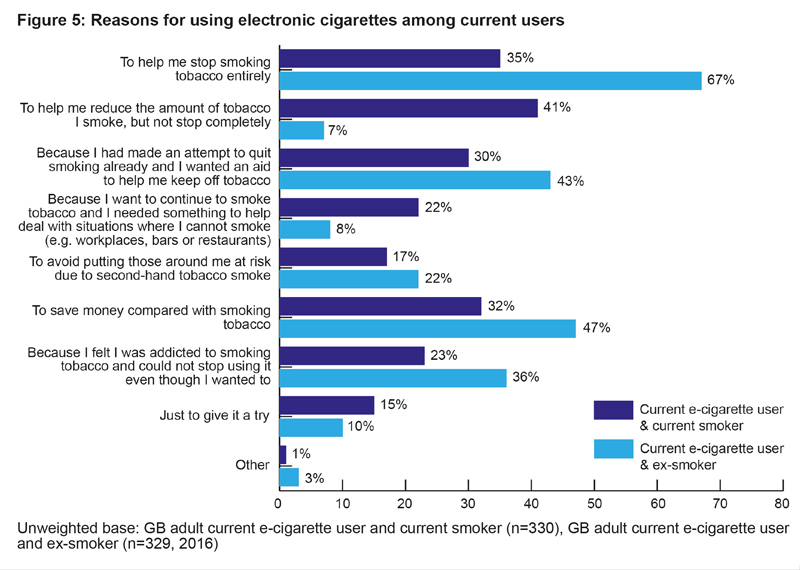 Despite a lot of good science being published on the subject, and organisations like the NHS supporting vaping as a less harmful alternative to smoking, the public is largely uncertain about the relative risks. Only 15% of those asked got it right – that vaping was ‘a lot less harmful’ than smoking. Do smokers understand the lesser risk of vaping? Again, many do not. The top reason listed for why smokers who have never vaped have never tried it is that they are worried that it might not be safe – at 27%. Meaning that up to a quarter of current smokers may potentially try vaping as an alternative to smoking if they really understood the risks! Can vaping be a pathway to quitting nicotine entirely? The Ash results say yes. 10% of vapers use an e-liquid that has no nicotine in it at all. 37% of vapers use concentrations of 8 mg/ml or less. Only 9% use e-liquids at of 19 mg/ml or higher. What is the significance of the ASH survey showing such positive results about vaping? Frankly, the results of the latest ASH survey are a very big deal for the vaping community, and the businesses that serve it. In the early years, ASH was heavily against vaping in all forms and in all ways, and there was a great deal of concern from both the Government and the medical community. They used to feel that Britain would be better off without e-cigarettes in it at all. Of course, that has all changed now. Vaping supporters have been convinced all along of the health benefits of switching from smoking to vaping. As more and more accurate scientific investigations into the actual health effects of vaping as opposed to smoking have been made, we are pleased to see acknowledgement of the positive role vaping can play in the lives of ex- smokers and those still trying to quit. What is the biggest challenge to vaping being accepted as a real, effective and healthier alternative to smoking? The biggest stumbling block for vaping is misguided public opinion and outright disinformation about its relative safety, and its usefulness to those who are struggling to quit smoking. However, as more health and governmental bodies change their policies to support vaping as a healthier alternative to smoking, we can expect public opinion to follow suit. For more information and in-depth analysis see link below. This entry was posted in Industry News by Liberty Flights. Bookmark the permalink.